A Master's degree in Addiction Counseling online or a Master's in Substance Abuse Counseling online trains you to help the growing number of people suffering from substance abuse and addiction. These programs typically meet the education requirement for licensure, a necessary step to pursuing a career in substance and addiction counseling. A master's degree also increases career opportunities and pay. Whether already working in the mental health field or just exploring a career change, individuals interested in a career in professional substance abuse counseling may consider a Master's degree in Rehabilitation Counseling or a Master's degree in Substance Abuse Counseling or a Master's degree in Addiction Counseling or related degrees. Some individuals acquire a general master's degree in psychology, community counseling or social work and supplement the degree with a certificate in substance abuse counseling. What type of master's degree does a Substance Abuse Counselor need? What type of career is Substance Abuse Counseling? Where do Substance Abuse Counselors typically work? Is Substance Abuse Counseling a growing field? What are the licensing requirements for Substance Abuse Counselors? Are there any accreditations that I should look for in Substance Abuse Counseling programs? Are there professional certifications or associations for Substance Abuse Counselors? We selected the online degree programs based on the quality of the program, the types of courses offered, the faculty, rankings, awards, and reputation, including the school's reputation for effectively providing quality online degree programs. The list also includes related degree programs. Virginia Commonwealth University ranks #1 on The 20 Best Online Master in Substance Abuse Counseling Degree Programs! Virginia Commonwealth University, a public research university founded in 1838, enrolls more than 31,000 students. Virginia Commonwealth University offers graduate and undergraduate programs across a variety of well-regarded schools, including its School of the Arts, and School of Medicine. In addition to enrolling students on its main campus and online, Virginia Commonwealth University has another campus, in Qatar, which focuses on art programs. Virginia Commonwealth University offers an online Master of Science in Rehabilitation and Mental Health Counseling degree program which provides students with a strong foundation in culturally responsive and ethical counseling practices and prepares them to work in a variety of professional counseling settings through focusing on clinical training experience in different environments. The program instills in students a philosophy of counseling which focuses on the dignity, worth, and rights of all individuals in society. Students enhance their ability to exercise skills which promote and realize this philosophy. Students in the Master's degree in Addiction Counseling online program must complete a practicum and supervised clinical practice. The program requires two one-week residencies for on-campus study; with approval students can complete them at a local college. Students may focus their studies directly on substance abuse and addiction counseling through elective coursework, and through pursuing their practicum and supervised clinical practice at relevant facilities. Virginia Commonwealth University is accredited by the Southern Association of Colleges and Schools Commission on Colleges (SACSCOC). The Department of Rehabilitation Counseling is fully accredited by the Council on Rehabilitation Education (CORE). University of North Texas ranks #2 on The 20 Best Online Master in Substance Abuse Counseling Degree Programs! The University of North Texas, a public university founded in 1890, enrolls more than 37,000 students. Among a variety of undergraduate, graduate, and professional programs, the University of North Texas offers a Jazz studies program, notable for being the first of its kind in the country. The University of North Texas offers an online Master of Science in Rehabilitation Counseling degree program, designed to prepare students to work as professional rehabilitation counselors in a variety of settings, including inpatient and outpatient treatment facilities. The program instills students with a balance of clinical knowledge and ethical foundation, emphasizing the importance of a strong commitment to human rights, alongside a commitment to best practices in treatment and healing. Students enhance their ability to provide high-quality services to their clients, and help clients establish or re-establish control in their lives. Students in the Master's degree in Addiction Counseling online program must complete a practicum and internship. The program culminates in a comprehensive exam or a certification exam. Students may focus their studies directly on substance abuse and addiction counseling through elective coursework, and through pursuing their practicum and internship at relevant facilities. The University of North Texas is accredited by the Southern Association of Colleges and Schools Commission on Colleges (SACSCOC). The Department of Disability and Addiction Rehabilitation is fully accredited by the Council on Rehabilitation Education (CORE). University at Buffalo ranks #3 on The 20 Best Online Master in Substance Abuse Counseling Degree Programs! The University at Buffalo, a public university founded in 1846, enrolls nearly 30,000 students, making it the largest university in the State University of New York System (SUNY). The University at Buffalo offers numerous undergraduate, graduate, and professional programs. Originally a private university, the University at Buffalo became part of the SUNY system in 1962. The University at Buffalo offers an online Master of Science in Rehabilitation Counseling degree program designed to prepare students for a variety of careers in rehabilitation counseling, including addiction and substance abuse counseling at all levels. The program provides a rehabilitation counseling curriculum with a commitment to respecting and incorporating diversity and promoting personal integrity and professional ethics. Students in the program enhance their ability to assess and treat the individual needs of their clients, break down physical and attitudinal barriers which affect them, and help their clients establish control and positive change in their lives. Students in the online MS in Rehabilitation Counseling program must also complete a practicum, an internship, and comprehensive exam or research project. The University at Buffalo is accredited by the Middle States Commission on Higher Education (MSCHE). The Department of Counseling, School, and Educational Psychology is fully accredited by the Council on Rehabilitation Education (CORE). UMass, Boston ranks #4 on The 20 Best Online Master in Substance Abuse Counseling Degree Programs! The University of Massachusetts, Boston, a public research university founded in 1964, enrolls approximately 17,000 students, with a low student-to-faculty ratio, across 11 colleges, 82 undergraduate programs, and 126 graduate programs. As part of the University of Massachusetts system, The University of Massachusetts Boston offer online degree programs through UMass Online. The University of Massachusetts, Boston offers an online Master of Science in Rehabilitation Counseling degree program which emphasizes adaptation as a tool of progress and accomplishment and respect for the culturally diverse backgrounds of all people. Students enhance their ability to serve clients and meet their individual needs through advancing educational access, and economic and social participation. The program prepares students to work in a variety of settings, serving people of many different backgrounds. Students must also complete a practicum and internship. Students may focus their studies directly on substance abuse and addiction counseling through elective coursework and through pursuing their practicum and internship at relevant facilities. The substance and addiction counseling program utilizes a cohort model in which all students complete the same program of study. The program requires two weeks of on-campus study in the first summer. The University of Massachusetts, Boston is accredited by the New England Association of Schools and Colleges (NEASC). The School for Global Inclusion and Social Development is fully accredited by the Council on Rehabilitation Education (CORE). West Virginia University ranks #5 on The 20 Best Online Master in Substance Abuse Counseling Degree Programs! West Virginia University, a public university founded in 1867, enrolls more than 28,000 students across 15 schools and 200 undergraduate, graduate, and professional programs. Among those, West Virginia University offers highly regarded rural medicine and primary care programs at its School of Medicine. Through its online division, WVU Online, West Virginia University offers an online Master of Science in Clinical Rehabilitation and Mental Health Counseling degree program which prepares students for entry-level rehabilitation and mental health counseling positions. Students enhance their ability to better assess, diagnose, and treat individual clients experiencing disabilities and other disadvantages in various aspects of their lives, as well as their spouses and their families. The program establishes a foundation in students of a competent and ethical approach and understanding toward addressing a variety of unique issues in diverse communities. Students in the Master's degree in Addiction Counseling online program must also complete a practicum and an internship. The program also requires two residencies on campus in Morgantown for completion, the first for a week, the second for three days. West Virginia University is accredited by the Higher Learning Commission (HLC). The Department of Counseling, Rehabilitation Counseling, and Counseling Psychology is fully accredited by the Council on Rehabilitation Education (CORE). Assumption College ranks #6 on The 20 Best Online Master in Substance Abuse Counseling Degree Programs! Assumption College, a private, Catholic university founded in 1904, enrolls approximately 2,500 students, with a low student to faculty ratio, in a variety of undergraduate and graduate programs. Assumption College uses a model which allows for a personal educational experience for each student. Assumption College offers an online Master of Arts in Rehabilitation Counseling degree program which addresses current and emerging issues in the field of rehabilitation counseling and in the communities served. Students enhance their ability to be effective counselors through theory, practical knowledge, and a strong ethical foundation, working toward positive, meaningful change in the lives of their clients from a variety of diverse backgrounds and in a variety of diverse settings. Students in the Master's degree in Addiction Counseling online program must complete a practicum and an internship. Students may focus their studies directly on substance abuse and addiction counseling through elective coursework, and through pursuing their practicum and internship at relevant facilities. The courses primarily utilize an asynchronous format, but the program does require two five-day on-campus residencies, one in each summer semester. Assumption College is accredited by the New England Association of Schools and Colleges (NEASC). The Institute of Human Services and Rehabilitation Studies is fully accredited by the Council on Rehabilitation Education (CORE). Emporia State University ranks #7 on The 20 Best Online Master in Substance Abuse Counseling Degree Programs! Emporia State University, a public university founded in 1863, enrolls around 6,000 students across four different schools, with a variety of graduate and undergraduate programs. As Kansas only became a state in 1861, Emporia State University holds the distinction of being one of the oldest Universities in the area. Emporia State University offers a Master of Science in Rehabilitation Counseling online degree program which cultivates professional knowledge, ethical principles, and social responsibility. Students graduate prepared for careers in the field in a variety of settings and enhance their ability to effectively assess and meet the individual needs of their clients, to manage their cases, and offer other rehabilitation services to help the clients make positive change in their lives. Students in the substance and addiction counseling program must also complete a practicum and an internship. Students may focus their studies directly on substance abuse and addiction counseling through elective coursework, and through pursuing their practicum and internship at relevant facilities. Emporia State University is accredited by the Higher Learning Commission (HLC). The Department of Counselor Education is fully accredited by the Council on Rehabilitation Education (CORE). 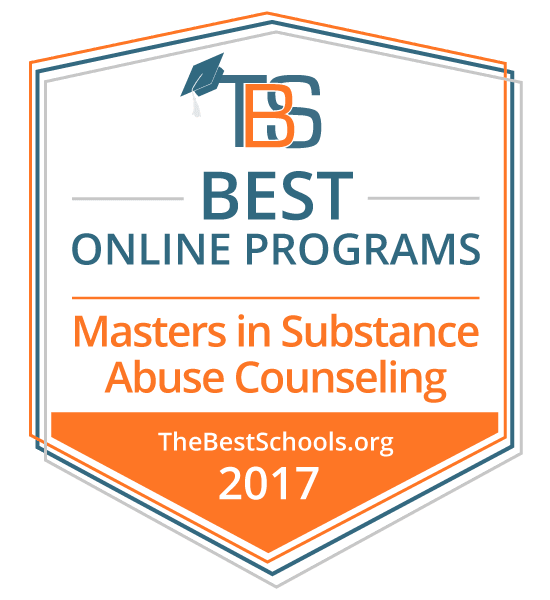 Thomas University ranks #8 on The 20 Best Online Master in Substance Abuse Counseling Degree Programs! Thomas University, a private university founded in 1950, enrolls a limited number of students, around 1,000. The graduate and undergraduate programs at Thomas University feature a low student-to-faculty ratio and an emphasis on professional career development alongside academics. Though it has seen several name and status changes in its history, Thomas University now operates as a sectarian university. Thomas University offers an online Master of Science in Clinical Rehabilitation and Mental Health Counseling degree program, with an option for specialization in Addictions and Alcoholism Counseling. Students in the program develop the skills necessary to serve their clients in a way consistent with the program's mission of advocacy and awareness. Students enhance their ability to assess and meet the needs of their clients through applying theoretical and practical knowledge, community services and resources, and through ethical, field-standard practices. Students in the Master's in Addiction Counseling online program must complete a practicum and an internship. Students may focus their studies directly on substance abuse and addiction counseling through elective coursework and through pursuing their practicum and internship at relevant facilities. The program provides opportunities for graduate assistantships. Thomas University is accredited by the Southern Association of Colleges and Schools Commission on Colleges (SACSCOC). The Division of Counseling and Psychology is fully accredited by the Council on Rehabilitation Education (CORE). Indiana Wesleyan University ranks #9 on The 20 Best Online Master in Substance Abuse Counseling Degree Programs! Indiana Wesleyan University, a private university affiliated with the Wesleyan Church and founded in 1920, enrolls around 3,000 students in a variety of undergraduate, graduate, and professional programs. As an evangelical institution, Indiana Wesleyan University incorporates religious teachings and its mission into its academics, and holds the title of the largest member of the Council for Christian Colleges and Universities. Indiana Wesleyan University's Master of Arts in Clinical Addiction Counseling online degree program prepares students to deal with substance abuse and chemical addictions, as well as eating, sexual, and gambling addictions. The Clinical Addiction Counseling Master's degree program prepares students to work in a variety of professional settings as Christian counseling professionals. The program also enhances their ability to serve their clients, and their clients' families, through evidence-based practice which integrates a Christian worldview with a strong foundation in social and behavioral sciences. Students in the Master's degree in Addiction Counseling online program must also complete an internship. Indiana Wesleyan University is accredited by the Higher Learning Commission (HLC). University of South Dakota ranks #10 on The 20 Best Online Master in Substance Abuse Counseling Degree Programs! The University of South Dakota, a public university founded in 1862, enrolls nearly 10,000 students in a variety of undergraduate, graduate, and professional programs. The state's oldest university, with its founding precedes the official statehood of South Dakota by 27 years, and it holds the title of South Dakota's only designated liberal arts university. The university designed the online Master of Arts in Addiction Studies degree program for professionals already working in the field of addiction counseling, looking to advance their careers. Toward this goal, the program comes in two varieties: a standard track, and an advanced track, for professionals already Certified or Licensed as an Addiction Counselor, or who have successfully completed an addiction studies bachelor's degree. The online Master in Addiction Studies program enables students to advance their careers in the field of addiction and substance abuse counseling through advancing their education and qualifications. Students develop a strong foundation in ethical practices and contemporary clinical theories and approaches, enhancing their ability to serve their clients through private, group, and family counseling sessions, in a variety of treatment settings. Students in the online MA in Addiction Studies program must also complete an internship. The substance and addiction counseling program, designed for working professionals, requires one year of field experience for admission. The University of South Dakota is accredited by the Higher Learning Commission (HLC). University of Oklahoma, Tulsa ranks #11 on The 20 Best Online Master in Substance Abuse Counseling Degree Programs! The University of Oklahoma, a public university founded in 1890, enrolls more than 30,000 students. A satellite campus of the main university, The University of Oklahoma, Tulsa, offers more than 30 select graduate and undergraduate programs, including online degrees. The University of Oklahoma, Tulsa campus traces its origins back to when the School of Library and Information Studies began offering classes in Tulsa in 1957. The University of Oklahoma, Tulsa offers an online Master of Prevention Science degree program, focused on the impact of substance abuse on individuals, families, and communities worldwide. The program instills in students the skills and knowledge necessary to enhance their ability to fight addiction and substance abuse as counselors and prevention specialists in a variety of professional settings. Students in the Master's degree in Addiction Counseling online program may complete an internship as an elective course. The University of Oklahoma, Tulsa is accredited by the Higher Learning Commission (HLC). Nova Southeastern University ranks #12 on The 20 Best Online Master in Substance Abuse Counseling Degree Programs! Nova Southeastern University, a private university founded in 1964, enrolls more than 23,000 students, with the great majority pursuing graduate and professional programs. The school utilizes a trimester-based calendar and offers programs of study across 18 different schools. Nova Southeastern University offers an online Master of Science in Counseling degree program, with the option to specialize in Substance Abuse Counseling, or Substance Abuse Counseling and Education. Designed for people entering or already working in the field of professional counseling, the program allows students to advance their careers through furthering their education and qualifications. Students enhance their ability to provide effective counseling methods to clients suffering from substance abuse and addiction issues and those related to the clients, through utilizing practices which reflect current clinical and ethical standards. Students in the Master's degree in Addiction Counseling online program must complete a practicum; students pursuing the Substance Abuse Counseling and Education specialization must complete two practicums. The courses utilize an asynchronous format. Ottawa University ranks #13 on The 20 Best Online Master in Substance Abuse Counseling Degree Programs! Ottawa University, a private Christian university founded in 1865 and affiliated with American Baptist Churches USA, enrolls a limited number of students, around 5,000 total. While the main campus in Ottawa, Kansas has a small residential enrollment, Ottawa University has eight campuses around the country, as well as online program, offering a variety of graduate and undergraduate degrees. Ottawa University offers an online Master of Arts in Addiction Counseling degree program designed to prepare students for a career in the field of addiction counseling. Integrating theory, research, and practice, the program prepares students to work in a variety of settings, assessing and treating the individual needs of clients struggling with addiction. Students in the substance and addiction counseling program must also complete a practicum. Ottawa University is accredited by the Higher Learning Commission (HLC). University of the Cumberlands ranks #14 on The 20 Best Online Master in Substance Abuse Counseling Degree Programs! The University of the Cumberlands, a private, Christian university affiliated with the Kentucky Baptist Convention and founded in 1889, enrolls approximately 6,000 students in a select variety of undergraduate, graduate, and professional programs across four schools. The University of the Cumberlands offers an online Master of Arts in Professional Counseling degree program, with the option to pursue an Addiction Counseling Track. The program teaches students how to apply contemporary theories of intervention and prevention practices for effective addiction counseling, for individuals and groups. Students enhance their ability to assess, diagnose, and develop a treatment plan for their clients. The program prepares students to pursue a career in professional addiction counseling in a variety of settings. Students in the Master's in Addiction Counseling online program must also complete a practicum and an internship. The University of the Cumberlands is accredited by the Southern Association of Colleges and Schools Commission on Colleges (SACSCOC). Liberty University ranks #15 on The 20 Best Online Master in Substance Abuse Counseling Degree Programs! Liberty University, is a private, Christian university located in Lynchburg, VA and was founded in 1971 by Jerry Falwell. Liberty University has students in over 550 different undergraduate, graduate, and professional programs. Liberty University's Master of Arts in Addiction Counseling online degree program integrates contemporary addiction counseling theories and practices with biblical counseling principles. Students in the program enhance their ability to act as effective counselors and promote positive change in the lives of their clients through assessment of their needs and designing a treatment plan, applying counseling methods, working with clients and their families to establish a healing environment, and incorporating their faith as a foundation for therapeutic guidance. Liberty University also offers online a Master of Arts in Human Services Counseling – Addiction and Recovery degree, and an online Master of Arts in Pastoral Counseling – Addiction and Recovery degree. Students in the Master's degree in Addiction Counseling online program must complete an internship. The program also includes three intensive courses which require five days on campus each. Washburn University ranks #16 on The 20 Best Online Master in Substance Abuse Counseling Degree Programs! Washburn University, a public university founded in 1865, enrolls nearly 7,000 students in a variety of undergraduate, graduate, and professional programs with a low student-to-faculty ratio. Initially founded as Lincoln College, the name of the school changed to Washburn College in 1868 after Ichabod Washburn made a sizable donation to the school, from who the school's mascots, the Ichabods, also derive their name. Washburn University offers an online Master of Arts in Human Services/Addiction Counseling degree program which provides a holistic, integrative approach to the work of addiction counseling. Students enhance their ability to apply theory and research in the field toward serving their clients, assessing, diagnosing, and treating their clients so as to promote positive change and healing. The program prepares students to pursue and advance careers in a variety of settings in the addiction counseling field. Students in the substance and addiction counseling program must also complete a practicum, as well as an internship if they do not already have relevant prior internship or work experience. Governors State University ranks #17 on The 20 Best Online Master in Substance Abuse Counseling Degree Programs! Governors State University, a public university founded in 1969, enrolls more than 5,000 students in a limited selection of undergraduate and graduate programs. Initially utilizing a liberal academic model which gave out competencies in place of grades, Governors State University has developed into a more traditional university over its history. Governors State University offers an online Master of Health Science in Addiction Studies degree program which emphasizes contemporary, evidence-based approaches to understanding and treating addiction. Students in the program enhance their ability to assess and treat clients, and utilize the skills and knowledge they acquire to initiate positive change not only in their clients, but in their communities. Students in the Master's degree in Addiction Counseling online program must also complete an internship and a comprehensive exam. Governors State University is accredited by the Higher Learning Commission (HLC). Grand Canyon University ranks #18 on The 20 Best Online Master in Substance Abuse Counseling Degree Programs! Grand Canyon University, founded in 1949, enrolls nearly 70,000 students in a variety of graduate and undergraduate programs. Though initially founded as a non-profit university, when Significant Education LLC bought Grand Canyon University in 2004, it became the first for-profit Christian university in the U.S. While a significant portion of its student population attends class on campus, the majority of its enrolled students pursue their degrees entirely online. Grand Canyon University's online Master of Science in Addiction Counseling degree program prepares students for careers in the field of addiction counseling, including private practice, clinical work, group practice, and owning their own practice. Students enhance their ability to diagnose, assess, and treat clients, with a curriculum which addresses practical and theoretical knowledge, as well as cultural and diversity issues in counseling, and well as adolescent addiction treatment. Students in the Master's degree in Addiction Counseling online program must also complete pre-practicum fieldwork experience, and a practicum or internship. The courses utilize an eight-week format. Post University ranks #19 on The 20 Best Online Master in Substance Abuse Counseling Degree Programs! Post University, a for-profit university founded in 1890, enrolls 7,000 students in a limited number of undergraduate and graduate programs, across several campuses and online. Post University provides an online Master of Science in Human Services degree program, with an option for concentration in Alcohol and Drug Counseling. Designed for professionals already working in rehabilitative counseling or similar fields, the program helps students advance their careers through advancing their education. Students enhance their ability to make effective, long-term impact in the lives of the people they serve and assist, through expanding their knowledge of prevention, assessment, diagnosis, and prevention in an interdisciplinary curriculum. Students in the online Master in Human Services program must also complete a practicum or internship, and a capstone research project. Post University utilizes a continuous academic calendar. As an accelerated program, courses in the substance and addiction counseling program occur as eight-week modules and in an asynchronous format. Walden University ranks #20 on The 20 Best Online Master in Substance Abuse Counseling Degree Programs! Walden University, a for-profit university founded in 1970 and part of the Laureate International Universities network, enrolls more than 47,000 students in a variety of undergraduate, graduate, and professional programs. Walden University offers online programs. The university utilizes a quartered academic calendar. Walden University provides an online Master of Science in Addiction Counseling degree program, with numerous options for specialization beyond the General Program, including: Addictions and Public Health; Child and Adolescent Counseling; Family Studies and Interventions; Forensic Counseling; Military Families and Culture; and Trauma and Crisis Counseling. Through offering different specializations, the online MS in Addiction Counseling program at Walden University prepares students for addiction counseling careers in a wide variety of settings, including inpatient and outpatient treatment centers, schools of all levels, private practice, veterans' affairs facilities, and the legal system. Students enhance their ability to address, diagnose, and treat addiction and complications arising from addiction across all walks of life. Students pursuing the Master's degree in Addiction Counseling online program must also complete a practicum and an internship. Walden University is accredited by the Higher Learning Commission (HLC). Typically, online Master's in Substance Abuse Counseling degrees and Master's in Addiction Counseling online degrees provide students with learning experiences via internships and practicums, as well as a curriculum required to sit for licensing board exams. Substance abuse counseling related graduate programs provide students with the knowledge and skills in prevention and in-treatment methods to help addicted clients. The programs cover subjects such as assessing clients, counseling techniques, community services, research methods, treatment methods for drug and alcohol abuse, addiction and recovery process, diagnosis of substance use disorders, psychopharmacology and other drugs, and methods of group counseling. Some graduate programs provide specializations such as drug abuse counseling, alcohol abuse counseling, and clinical counseling, Individuals interested in working in medical and healthcare-specific settings may consider a program with a clinical counseling specialization and individuals interested in working in a social work setting may consider a rehabilitation counseling specialization. Some of the Master's in Substance Abuse Counseling online degrees, Master's in Addiction Counseling online degrees, and related degrees require a specific number of days for face-to-face meetings. Also, many of these programs require students complete an internship. Substance abuse and addiction counselors work with clients in one-on-one sessions and group sessions and as part of a caregiving team. Besides working with patients some substance abuse counselors are involved in the administration aspects of their agency. The Bureau of Labor Statistics forecasts a 22 percent employment growth for substance abuse and behavioral disorder counselors from 2014 to 2024, much faster than the average for all occupations. Substance abuse counselors in private practice must have a license. Every state requires a master's degree and 2,000 to 4,000 hours of supervised clinical experience. Counselors must also pass a state-issued exam and every year complete continuing education. Individuals interested in pursuing a career in any type of counseling should always check with their state board of licensure to determine certification and licensing requirements. The licensure or certification criteria for substance abuse counselors outside of private practice vary for each state. Not all states require a specific degree, however may state require candidates pass an exam. The Council on Rehabilitation Education (CORE) is recognized by the Council for Higher Education Accreditation (CHEA) and is a member of the Association of Specialized and Professional Accreditors (ASPA). CORE accredits graduate programs which provide academic preparation for a variety of professional rehabilitation counseling positions. The National Board for Certified Counselors (NBCC), Inc. and Affiliates, a national certifying organization for professional counselors in the United States, is an independent non-profit credentialing organization which oversees a national certification system. The organization identifies certified counselors and maintains a register of these certified counselors. The organization's National Certified Counselor (NCC) and Master Addictions Counselor (MAC) certifications are accredited by the National Commission for Certifying Agencies, the accrediting organization of the Institute for Accrediting Excellence. All 50 states as well as the District of Columbia and Puerto Rico, use its examinations for professional counselors. The NBCC provides students well advanced in a participating counselor preparation program the opportunity to begin the National Certified Counselor (NCC) application process prior to graduation. The NBCC also provides resources for students. The National Association for Alcoholism and Drug Abuse Counselors (NAADAC) represents the professional interests of over 95,000 addiction counselors, educators as well as other addiction-focused healthcare professionals in the United States, Canada and abroad. The NAADAC members include professionals who specialize in addiction prevention, treatment, recovery support, and education. The National Certification Commission for Addiction Professionals (NCC AP) under the auspices of the NAADAC operates as an independent organization for issues involving the association's substance use disorders counselor certification and endorsement opportunities at the national and international level. The Commission on Rehabilitation Counselor Certification (CRCC), a nonprofit organization, serves as a national certifying organization for professional rehabilitation counselors. The CRCC maintains and monitors a national certification program for Certified Rehabilitation Counselors. The CRCC also maintains a register of all Certified Rehabilitation Counselors and provides certification status for the public. The CRCC Certification Program is accredited by the National Commission for Certifying Agencies, the accrediting organization of the Institute for Credentialing Excellence. Certified Rehabilitation Counselors may specialize in numerous areas of rehabilitation counseling including substance abuse/addictions counseling. The International Association of Addictions and Offender Counselors (IAAOC) includes professional substance abuse/addictions counselors, corrections counselors, students and counselor educators. The association has a mission to provide leadership in and advancement of the professions of addiction and offender counseling. The IAAOC provides student membership for students enrolled at least half-time in a college or university program. The IAAOC reports the website is designed to create a community among practitioners, researchers, graduate students and counselor educators. The Addiction Technology Transfer Center Network (ATTC), strives to improve the quality of addictions treatment and recovery services through facilitating alliances among front-line counselors, the health and mental health communities, policy makers, treatment and recovery services agency administrators, faith-based organizations, consumers and others. ATTC connects people to the latest research and information through activities such as academic education, online and distance education, skills training, workshops, conferences, and publications.